Greg is absolutely amazing! Our engagement shoot was awesome and fun! He is very personable and talented! He is def worth every penny and more! We will continue to use him in the future! It was certainly an Honor Alexia, you and Ashton made it incredibly easy. It was such a joyful experience; you are a natural! Greg is amazing! I just had my bridal portrait session and it was more than I could imagine. He definitely knows what he is doing and his experience really shows, not to mention what a great personality to go with the expertise! I am looking forward to my wedding with Greg as my photographer!! I would highly recommend! Greg is absolutely amazing. He has such grace, ease and personality that would make anyone feel comfortable and at home. He did a honeymoon shoot with my wife and I, which was a great experience. I am not photogenic one bit, but with Gregs direction, he cause my pics to turn out beautiful. He has an eye for pure emotion and is so creative. That's my boy now. Gre is awesome photographer, he made me and my husband feel extremely comfortable on our special day.He not only came early and stayed late. He captured the most important ,memorable moments. Greg truly loves his work and does everything in his power to make sure you’re special day is all about YOU also every pictures and every moments ends with laughter , perfection! He is truly a great photographer and amazing person. Gregoire is truly truly truly an amazing photographer, he made me and my fiancé wedding daily so special! My entire family and bridal party was in love with him and the shoots he was able to capture! Throughout our entire wedding process he would talk to us and get to know us! He was extremely commmited to capturing all of the shots we needed! And ensuring we were comfortable and having a great time! I would definitely use him again if we were to ever have a vow renewal! Truly truly truly amazing extremely professional and kind and wonderful photographer!!!! Thank you so much for making our day even more amazing! When we start having kids we will call you for those pics!!! Where do I even begin? Greg is absolutely brilliant! I first saw his work at a dear friend’s wedding last year, and from that day I knew I wanted him as our photographer. He captured the essence of our love and spirit, he has such an amazing talent for capturing ‘moments”. He made the entire photoshoot fun, enjoyable and natural. His creativity, personality, energy, and passion for his craft are unparalleled and is reflected in his work. His patience and precision to detail are amazing. From our initial meeting Greg was punctual, professional and attentive. I am in love with every image. Our photos are flawless. Our sneak peek photos took our breath away and the feedback has been amazing, which is a true testament to how creative and inventive his work is. Greg far exceeded our expectations for our one year wedding anniversary photoshoot. I can say without a doubt if you chose Imagery by Jules Photography, you will not be let down. In fact, you will be absolutely blown away! Greg was absolutely amazing. He was a joy to work with during both our engagement shoot and wedding day. He has great ideas and suggestions. I’m not sure how he did it, but Greg truly captured every single emotion and feeling throughout the entire wedding. Every shot he took was just as beautiful as the day. The pictures were absolutely awesome!!! We couldn’t be more pleased! We can't thank Greg enough for all he did for us and capturing every moment. He was professional, fun and just an outstanding photographer. He made us feel extremely comfortable. Greg clearly loves his work and does everything in his power to make sure your special day is perfect! He is a great photographer and person. I would hire him again in a heartbeat! Thanks Greg, you are truly awesome!!!! Greg is not only a phenomenal photographer, but he is also full of kindness and positive energy. There are so many positive things to say about Greg. He is professional, knowledgeable, genuine and passionate about creating everlasting memories. There was not one moment that we felt nervous or uncomfortable in front of the camera. The laughter and smiles flowed freely. If you are in need of a gentleman that knows his buisness, definitely call Greg at Imagery By Jules Photography! He will not only meet your expectations, he will beat them! Absolutely incredible positive talented creative professional photographer that energize you from the first sight! Wishing you Much success!! My Husband and I met Greg for the first time when we hired his services for our Engagement Shoot in March 2015 and we were very impressed by his professionalism right from the start. He makes you feel very comfortable right from the get-go and does an amazing job bringing the best out of his clients under very nervous situations. His personality is as radiant as his work. We were very happy with the photos he took at our Wedding and would definitely recommend him to anyone. Greg was absolutely amazing. Very professional. Well Dressed. Brought proper lighting for photos. Really flexible. His pictures really told the story of my event. Beautiful, Crisp, fun! I would recommend his work for not only wedding but any event that you have. He does really well with natural lighting as well. Greg's work is awesome! He not only came early and stayed late. He captured the most important moments. THank you so much Jules photography. Greg to date is the most phenomenal, affordable, jovial, professional photographer I have come in contact with. I have been in quite a few weddings, dealt with photographers and have heard more horror stories about people not being able to get in contact with their photographer, the pictures taking too long, the presentation not what was expected, etc. My mom passed Greg's number on to me and he was truly a God sent. We only needed him for ceremony/wedding party pictures. He captured many awesome pictures, including candids which I am very fond of. He was easy to work with for poses, and was friend, family and child friendly. We were having such fun taking pictures that we lost track of time to go to the reception! For picture delivery, he emailed us some copies of a few he had already developed, and they were crystal clear, memorable shots. We received follow up on when the pictures would be delivered, and as a man of integrity, he delivered with above and beyond service in presentation and ON TIME. If we needed anything else, we knew where to find him for more copies of our pictures and if we wanted a photo book, etc. Great job before, on and after our wedding day, and would HIGHLY recommend this gentleman for any of your event photography! I am at a loss for words when I think of the work that Imagery by Jules Photography did for my engagement and wedding. The professionalism displayed by he and his staff was amazing. After discussing with him the vision we wanted for our engagement and wedding, I checked out and let them do what they do best and I was not disappointed. The dedication to strategize and ensure the shots would be priceless was and is so appreciated. Everyone had a great time interacting with the photography team which made posing for shots even more fun and interesting. I enjoyed the fact that they were also able to think on their feet if a sudden inspiration for a shot came that would indeed be captivating or more comfortable. Upon receiving our wedding album and prints – I was brought to tears – wanting to relive that moment again. Imagery by Jules Photography captured more than I could have imagined and indeed told a story – our story - through pictures. My husband and I looked at pictures and were taken back in the moment of enjoying the engagement photo shoot and then seeing the vision for our wedding and reception unfold in prints and album. Thank you! Thank you! Thank you! Thank you! We had an amazing photo shoot, so many great pictures it was hard to decide what to put on our album. I'm very pleased with the quality of the work and look forward to working with him again. George Jules, photographed my engagement as well as my Wedding Day. I enjoyed both sessions. Mr. Jules was very Creative, he took my ideas and made them the most beautiful reality. He considered all my desires, poses, always attentive. The day of my wedding, he was on time with a willing crew covering all areas at the same time. Reminding me to constantly smile with encouraging comments after each great shot. With all this professionalism, he was very affordable creating a package to meet my budget. And finally providing you with the most crystal clear photos I've ever encountered. It's as if you could walk into the pictures and relive the moment again and again. I would and have recommended this photographer to anyone with confidence they would be as satisfied as I was, looking forward to more sessions for all of my occasions.#Truth# thank you! Greg is exceptionally talented and brings the best out of his clients! Not only does Imagery by Jules capture the memories of an event, but also makes the experience of working with Gregoire Jules memorable. From event concept to creation, Greg was a pleasure to work with. He is a true professional who brings creativity and confidence to his clients. He goes above and beyond and is willing to do what it takes to meet specific needs and ensure a successful outcome with the highest level of excellence. 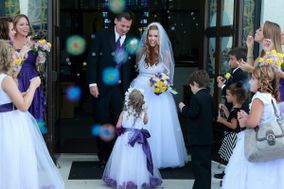 With Greg behind the lens, you can rest assured that your special moments will last a lifetime. Excellent photographer and very prompt & professional. Pictures looks like it can be in a magazine! I love it thanks Greg!! It is so easy working with Jules! The team worked with our tight and changing schedule and made sure to be prepared for nightime photos. The quality of the photos themselves are absolutely fabulous!! It brings a smile to my face every time I look at them and brings back the warmth of my now husband and I's union. If you're looking for quality service, professionalism AND easy to work with, then Imagery by Jules is who you should be working with!